It would be seemly, at my time of life,to have achieved a tidy house with family photos prettily displayed and Doulton figurines on polished tables. The problem is the books. Instead of sitting tidily on the bookshelves they overflow and drift all through the house, at a guestimate more than three thousand of them. We have tried to reduce the number. The children have each taken their personal stash and we have taken boxes to the local charity store. But more flow in, on birthdays and at Christmas, and the 'must have' treasures, other people's discards found at the charity store. I must take the matter in hand. Perhaps if I begin to assess them, one at a time, on this blog, I will come to terms with why I have kept them, what I must keep, and what can be given away. It is an eclectic,well thumbed, two person collection amassed over fifty years. It includes Doris Lessing, Rumer Godden, Kazuo Ishiguro, Enid Blyton, Damon Runyon, anthologies, gardening books, nice old dictionaries....you get the picture. Now, having resolved, where to begin? My bedside table I think. 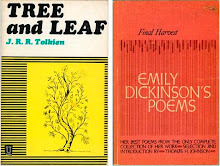 The first book that comes to my hand is a tattered, falling apart little paperback edition of Tolkien's 'Tree and Leaf. It contains his definitive essay 'On Fairy-stories' and an early short story 'Leaf by Niggle'. I think it is out of print. If I come across an intact copy I will buy it. But this one stays on my bedside table,I love it. It fits my hand so nicely and always falls open at the right page. "Faerie is a perilous land and in it are pitfalls for the unwary and dungeons for the overbold". Another keeper is Final Harvest, a collection of poems by Emily Dickinson. What is there to say that has not already been said about Emily Dickinson? It is a must for my bedside, a joy to open at random at any time. "This is my letter to the world that never wrote to me". The perfect way to close my first post to the blogosphere. 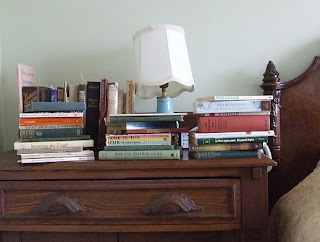 hello, I just discovered your blog via Middle of Nowhere and I really think you should not get rid of any books. I have and I regret giving them away (in particular my childhood books). So. Anyway, I'm from Illinois and I look forward to reading more of your posts! Hello, I can relate perfectly to this post because our house has more books than space! There is no such thing as too many books. It was like reading something that I had written, your post, except that it has only been 30ish years for me! I taught my self to read when I was 3 or so, and that is just what I do. No matter where I am or what I am doing. No matter what kind of book, or who wrote it or what age group it was written for. I am fond of old books, out of print, but with wonderful illustrations and phrasing you do not see too much of any more. Nobody I know, except my mother, understands this about me. It is nice to know that someone else has an old and tattered paperback of Tolkien on their bedside table. My father read 'The Hobbit' to me and my sister when I was 8, and I still have the very copy he read, missing cover and all. I cannot read it now almost 30 years later, with out hearing him reading it to me. A Happy Saint George's Day to you too! I love my little Spring edition of The Fairy Gazette, it is so charming!